You may have noticed that we’re not like those other stores. Not just because we operate solely online, no brick and mortar, which means you don’t have to pay the high prices of a store-front. And no, not just because we sell exclusively to our customers, never wholesale, so you can’t find these one-of-a-kind styles anywhere else. What sets us apart – well, in addition to those aspects – is our emphasis on a perfect fit. In dress shirts, our specialty, that means exact sizing. However, since standardized sizing is the norm in most big retail environments, you might not be familiar with how exact sizing works. Here’s how to measure yourself to find the specifications you’ll need for that perfectly fitted dress shirt. You’ll need three measurements: your collar size, your sleeve length, and your chest measurement. 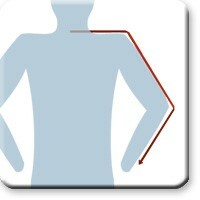 Find your collar size by measuring around your neck, placing the tape at the top of where your collar sits. 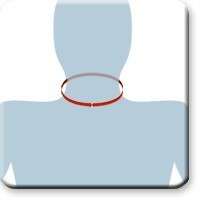 Keep two fingers between the measuring tape and your neck to allow for breathing room. That measurement is your collar size. Find your sleeve length by first measuring the distance from where your spine meets the base of your neck to the edge of your shoulder. Next, with your elbow slightly bent, measure from your shoulder to your wrist. Add these two numbers together to get your sleeve length. 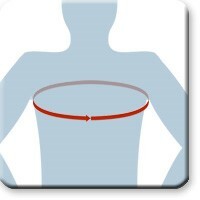 Find your chest size by measuring under your arms around the fullest part of your chest. Keep the measuring tape parallel to the floor. This number is your chest measurement. Still confused? Here’s a quick video to demonstrate these instructions. You’ll really only need to know your collar size and sleeve length to purchase a dress shirt; still, it’s always smart to check our chart to see if the collar size of your choice will also fit your chest. Otherwise, you may find that the collar and sleeves are perfect, but the chest is too tight! If your chest size is larger than the Fit Body Chest measurement for that collar size, you may wish to go up a collar size, which will accordingly correspond to a larger chest size. You’re almost there! Just choose one of our three fits for your new dress shirt: Regular Fit, Big & Tall, or Slim Fit. Regular Fit. This fit is cut generously for maximum comfort. Since all our shirts are 100% high-quality cotton, we’ve sized them slightly larger to allow for potential shrinkage. Big & Tall. This fit is tailored with 1¼” more length than our Regular Fit, and is the perfect fit for the man who needs a little extra sleeve length or a larger collar size. Big & Tall sizes will be notated with an asterisk and start at size 16-37. Slim Fit. This fit is made to accommodate a slimmer build and is tapered 4” narrower in the chest to 6” narrower at the waist in comparison to our Regular Fit. We hope this guide has made it clear how to measure for your dress shirt! If you still have any questions, feel free to contact us by phone at 1-800-247-1417 or by email at custserv@paulfredrick.com. 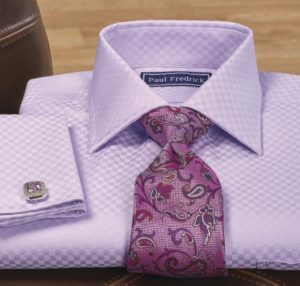 Now go check out our unparalleled variety of dress shirts!